Windows 8 may well be just around the corner but Acer isn't expecting massive things from the new OS. Speaking at an earnings call, J.T. Wang, CEO of Acer, warned that consumers are yet to show that they are ready for a new operating system for Windows so investors in the company should expect "explosive growth" straight after the launch. "We are still waiting for the signal of the consumers' enthusiasm," Wang explained and went on to note: "We see that a lot of PC brand companies and also the channels have a cautious attitude." 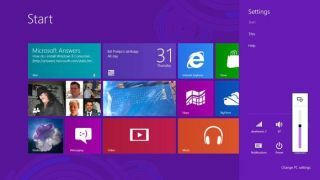 Windows 8 is a radical change for Microsoft. The OS is hoping to cater for tablets, laptops and desktops and there's also the release of Windows Phone 8 around the same time. So it's understandable the industry is cool to the launch of the OS – couple this with the impending launch of Microsoft's own tablet (which Acer has already complained about) and it's easy to see why OEMs may be indifferent to the launch of Windows 8. This isn't to say that Acer isn't embracing Windows 8. In the earnings calls, Wang also rang in the fact that it is fully prepped for its release, explaining: "Everyone is preparing for the Windows 8 launch, but still there is a lot of reservation, and so we do not see the momentum for very explosive growth has been accumulated." He also hinted that changes may be afoot when it comes to Windows RT. "Our original plan is to introduce RT early next year. "We have some projects ongoing. But we have to see what happened [sic] in the overall ecosystem."